Nordkraft Big Band is back in the country together with the legendary American big band leader and jazz bassist John Clayton. Aalborg, Skagen, Hjørring, Taastrup and Randers have already experienced the high musical level and great intensity when John Clayton is in front of Nordkraft Big Band! We once again promise a break of a concert, with one of the largest live jazz musicians on the international big band scene, in the company of one of Jutland’s leading big bands. The repertoire will consist mainly of Clayton’s own big band events that draw on his time in Count Basie’s big band, and with clear inspiration for Duke Ellington’s and Thad Jones legendary colors and sound images. Everything is seasoned with interesting features on the double bass from the master himself. CLICK HERE FOR MORE INFO. Clayton is affiliated with Nordkraft Big Band as artistic director in 2018 and 2019. He is, among other things, well known from his long-standing collaboration with the Canadian pianist and singer Diana Krall, but with a Grammy on the shelf, and another eight nominations, many others are fighting great artists also have a place in his tightly packed calendar. Besides the role of bass player, Clayton is also the leader of the best big bands in the United States, The Clayton-Hamilton Jazz Orchestra. Clayton has worked with Diana Krall, Oscar Peterson Trio, Paul McCartney, Regina Carter, Dee Dee Bridgewater, The Count Basie Orchestra, Queen Latifah, Charles Aznavour, Whitney Houston, Milt Jackson, Monty Alexander and many others. Is Aalborg and Nordjylland’s own rhythmic ensemble, with roots in the American bigband tradition. 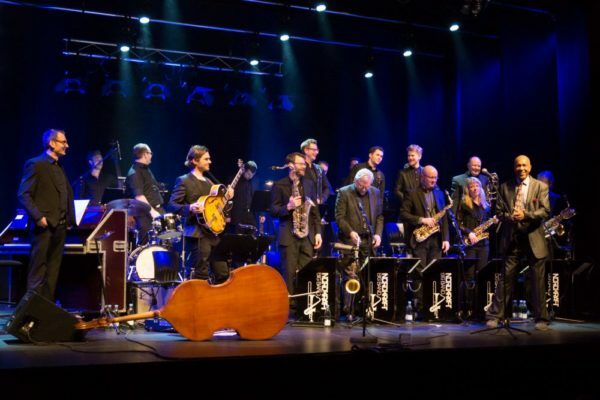 The Big Band has during the last couple of years marked itself as one of Jutland’s leading big bands and has worked with Bob Mintzer (USA), John Clayton (USA), Szhirley, Martin Brygmann, Nikolaj Bentzon, Sinne Eeg, Roger Neumann (USA), among others. , Bobo Moreno, Birthe Kjær, Niels Jørgen Steen, Robben Ford (USA), Veronica Mortensen, Mike Andersen, Søren Sko and Dorthe Gerlach.